Mobile Music is an installation and hanging mobile “score” that is continuously in motion. It can be interpreted as both a visual art piece or as a physical musical score. The installation is comprised of three elements: the physical mobile, the mobile’s shadow, and 14 hanging score fragments. Each element can be interpreted individually or in conjunction with the other visual elements of the piece. The score fragments were created using an anamorphic system and were designed to mimic the visual mobile through an analogy of turning and rotation. Bubble Interlude is a piece that explores the concept of “play” through the act of blowing bubbles and popping them. In this piece, bubbles take the form of both literal soap bubbles and metaphorical “sound” bubbles. Similar to the soap bubbles, sounds are formed and extinguished through a game of virtual “bubble catch.” The piece is designed for two people: one making longer sounds and forming the bubbles, and the other person generating shorter sounds, cutting off or altering the sounds, and popping the bubbles. The Frankolin was designed in 2009 by Leah Reid, Feifei Xue, and Adam Somers. The current edition of the Frankolin is an electric Yamaha with 11 added sensors. 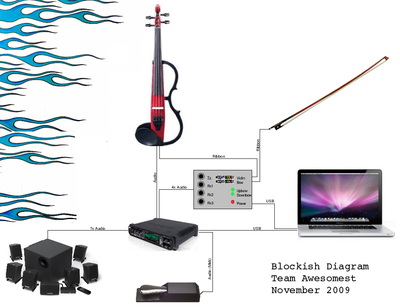 All of these sensors are placed such as not to interfere with normal violin playing so that they can be used both passively for gesture capture or actively for musical parameter control. Of the 11 total sensors, 3 are sonar receivers on the body of the instrument, 3 are from an accelerometer on the violin’s body, 3 are from an accelerometer on the bow, and 2 are force sensing resistors on the bow. A MAX/MSP patch aggregates the data from the three sonar receivers in order to determine bow position, reducing the number of inputs to 9. Audio signals at 40kHz audio signals are transmitted and received using an audio interface operating at 96kHz sampling rate. The three received sonar signals are combined into one and the result is linearized using a lookup table. These nine inputs are interpreted into musical performance data and are mapped onto various DSP parameters in a live-electronics, electro-acoustic setting. 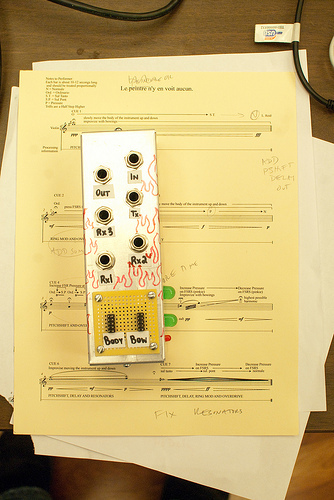 Because the Frankolin is receiving performance data directly from the performer, the misconnect between the performer’s actions and the resulting electronic sound is almost eliminated. 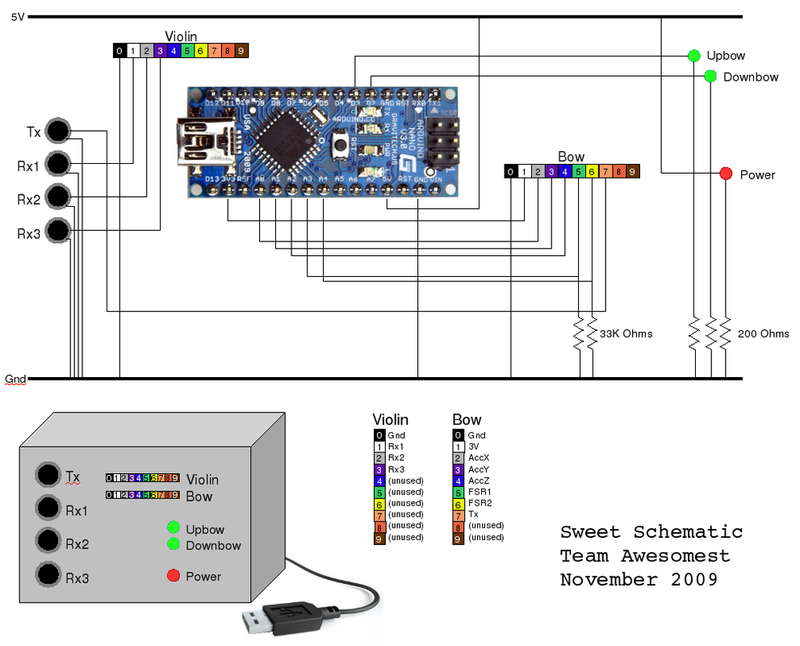 The received sensor data can either be mapped directly onto the performers own data or can be used as a controller to affect another ensemble member’s playing. 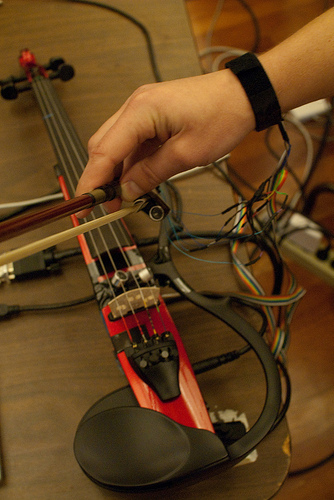 Although this augmented violin is not the first of its kind, the gestural data, mappings, and compositional usages of this data are entirely novel as well as cost-effective.